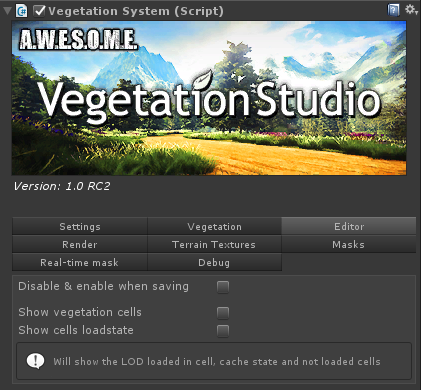 With “Disable vegetation in edit mode” checked the VegetationSystem Component will not initialize while in editor mode. This can be useful when vegetation setup is complete and you want to save editor resources or with multiple terrains in the same scene, where you only use 1 terrain for configuring. In order to handle fast culling and rendering of vegetation, VegetationSystem will split the terrain into cells. These are then culled using the CullingGroups API. Enable this option to see the current visible cells in sceneview. Cells are color coded based on visible LOD, Green, Yellow and Orange for vegetation distance and white for additional tree range. In addition to the current LOD you can also enable loadstate for the cells. A yellow ball is shown for cells already in cache.